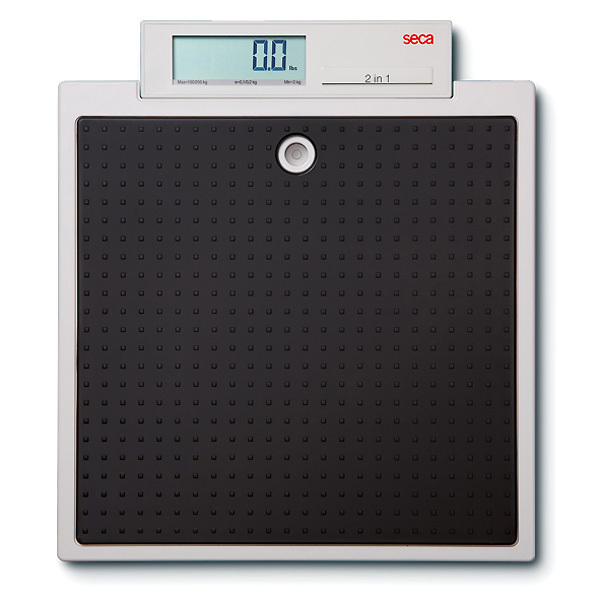 seca 876 Digital Transport Nurse Scales 550 lb. The base is made of a mixture of ABS plastics and Plexiglas. This combination guarantees a material with outstanding surface hardness and impact strength. Furthermore, it is easy to clean with any commercially available disinfectant. Additional steel elements in the base make sure that persons up to 250 kilograms can weigh themselves easily. The scale is easy to operate even with the display and operating elements integrated in the base. Just a light tap of the toe on the scale surface turns on the scale. Infants and small children can be easily weighed while being held by the mother. All she has to do is weigh herself separately first. Then the Mother-Child function ascertains the tare of the weight. Dimensions/platform (WxHxD): 313 x 58 x 315 mm / 12" x 12" x 2.3"